Every year around Mother's Day, the Social Security Administration releases statistics on the popularity of baby names in the previous year. 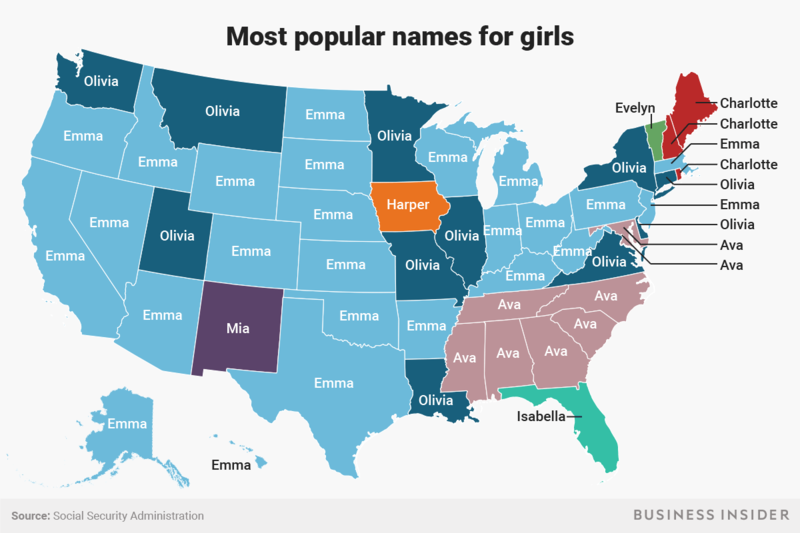 On Thursday, it released the most popular baby names in each state and DC. 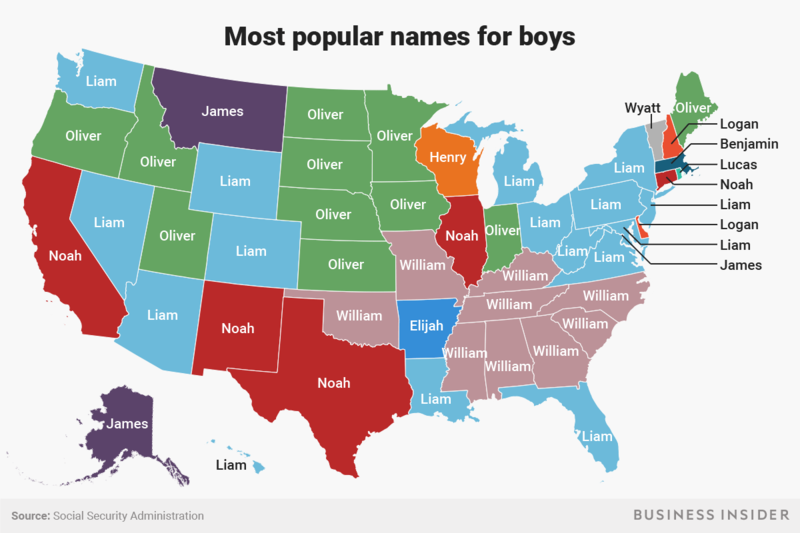 Last week, the Social Security Administration revealed that the most popular baby names in the US in 2017 were Liam and Emma. On Thursday, the administration released the most popular names for baby boys and girls in each state and DC last year, based on its comprehensive database of applications for Social Security cards from new parents. In France, local birth certificate registrars must inform their local court if they feel a baby name goes against the child's best interests. The court can then ban the name if it agrees, and will do so especially if it feels the name could lead to a lifetime of mockery. Germany has a number of baby-naming restrictions, including: no gender-neutral names; no last names, names of objects, or names of products as first names; and no names that could negatively affect the child's well-being or lead to humiliation. Like Germany, Switzerland also has a number of baby-naming restrictions, and the Swiss civil registrar must approve all baby names. In general, if the name is deemed to harm the child's well-being or be offensive to a third party, it will not be approved. Other rules include no giving a boy a girl's name or a girl a boy's name, no biblical villains, no naming your child a brand name, no place names, and no last names as first names. Unless both parents are foreign, parents in Iceland must submit their child's name to the National Registry within six months of birth. If the name is not on the registry's list of approved names, parents must seek approval of the name with the Icelandic Naming Committee. About half of the names submitted get rejected for violating Iceland's strict naming requirements. Among these requirements, names must be capable of having Icelandic grammatical endings, may not conflict with the linguistic structure of Iceland, and should be written in accordance with the ordinary rules of Icelandic orthography. So, for example, if a name contains a letter that does not appear in the Icelandic alphabet (the letters C, Q, and W, for example), the names are banned. Denmark has a list of about 7,000 approved baby names, and if your name choice doesn't make the cut, you have to seek permission and have your name choice reviewed at Copenhagen University's Names Investigation Department and at the Ministry of Ecclesiastical Affairs. More than 1,000 names are reviewed every year, and almost 20% are rejected, mostly for odd spellings. Norway has loosened its baby-naming lawsin recent years, but it has kept two key provisions. The name won't be accepted if it is considered to be a major disadvantage for the person or for other strong reasons. And you cannot choose a first name that is already registered in Norway's Population Register as a last or middle name (in Norway, middle names are essentially second surnames). 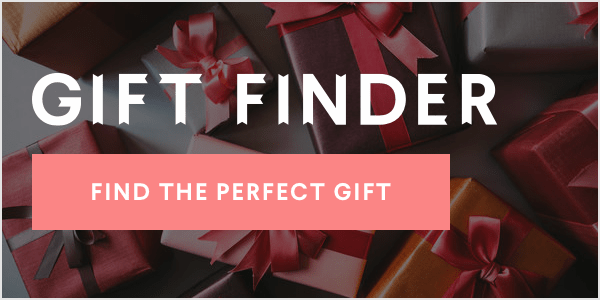 The exception is if the name has origins or tradition as a first name in Norway or abroad or has tradition in a culture that does not distinguish between first and last name. So naming your baby one of the most popular last names in Norway, like Hansen or Haugen, would not be allowed. Sweden bans first names that could cause offense to others or discomfort for the one using it. It bans other names that would be considered obviously unsuitable as a first name. Parents must submit the proposed name of their child within three months of birth to the Swedish Tax Agency and could face fines for failing to register a name. Malaysia has a list of names it considers "undesirable" and that are subsequently banned. On the list of unacceptable names are animals, insults, numbers, royal or honorary names, and food. A law passed in Sonora, Mexico, explicitly bans 61 first names that are either considered derogatory, lacking in meaning or mockable. Authorities say the objective is to protect children from being bullied because of their name. In New Zealand, parents are barred from giving names that would cause offense, that are longer than 100 characters, or that resemble an official title and rank. In Portugal, children's names must betraditionally Portuguese, gender-specific, and full, meaning no nicknames. To make things easier on parents, the country offers an 82-page list of namesthat denotes which are accepted and which are not. The Saudi government has banned more than 50 names it deems "too foreign," inappropriate, blasphemous, or not in line with the country's social or religious traditions.